Creating a world full of flavour! About mummy & me ! Any way back to baking business, this is the first bake in my new kitchen and newish oven and so I am very pleased with the results. Especially when the bake looks like what it is intended to be and the family approves it, there’s nothing like it. I managed to make my batch of hot cross buns just in time. 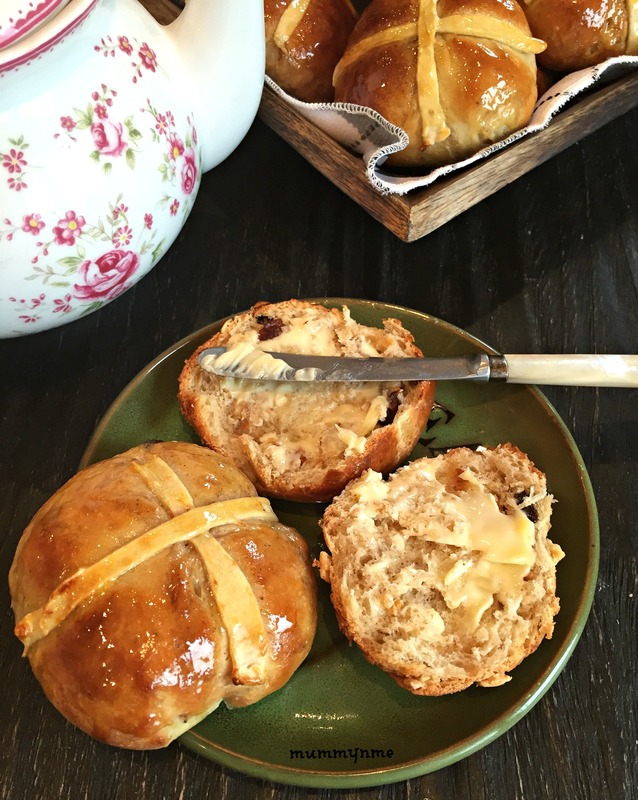 Easter Sunday breakfast feels complete with a heap of gorgeous buns, generous helping of butter and a tall mug of Black coffee – shouldn’t that be a definition of holidays?? 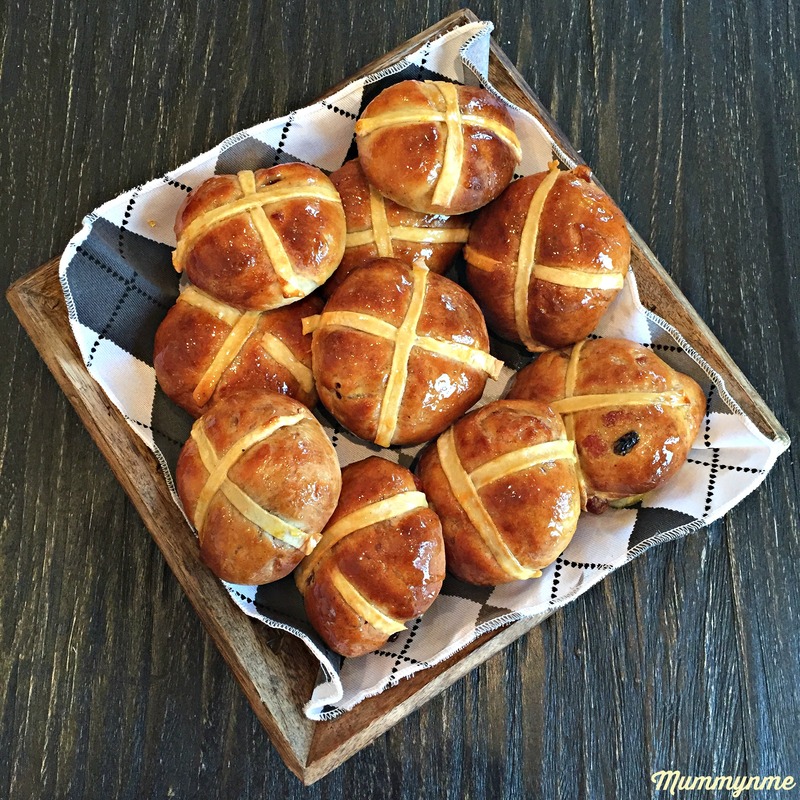 I have researched on so many recipes for hot cross buns. You see with some bakes , I don’t mind experimenting with flavours but I also don’t want to take it too far that it looses its respect as a traditional bake. You want to keep the speciality/traditional status of the bake in tact and that is a very hard balance to maintain. I hope you do give it a try, and like it . Warm the milk and keep aside . Mix Flour, salt, sugar and yeast and make a well in the middle. Add the milk and egg. Mix well . Bring the dough on to a floury surface and knead the dough really well. Initially the dough will be very sticky but as you work it through it should become more and more easy to handle. Use both hands all your strength and make a good smooth bouncy dough. Leave it to prove for an hour. Once the dough has raised and doubled up in size, add the dried fruits, spices clove and nutmeg powder and mix well until all the fruit and spices are evenly distributed. Leave this dough to prove again for an hour or till it is risen double its size. In an hour, take the dough out , without knocking too much air, make small balls maybe size of a squash ball (sorry for the randomness of bringing up squash, but what I want to say here is the ball needs to bigger than a ping pong ball and smaller than a tennis ball and I actually looked it up to see which ball is in the between and it was squash ball 🙂 ) Lay the balls on prepared baking trays. In a small bowl, add 4 TBSP of flour, little sugar, orange zest, about 1 tsp Butter and make a dough with water. Roll the dough flat, and using a knife cut long strips.Take the buns out from proving and indent cross on the buns using a knife. Place the stripes you made out the dough on the buns making the cross. Pre heat the oven to 120 degrees and place the buns in the oven for 15 – 20 mins. Remove and serve with some butter!! Make the glaze ready for the buns. Take a small sauce pan , add 3 TBSP golden syrup, Some Orange Zest and heat it until it is all melted. Using a brush. 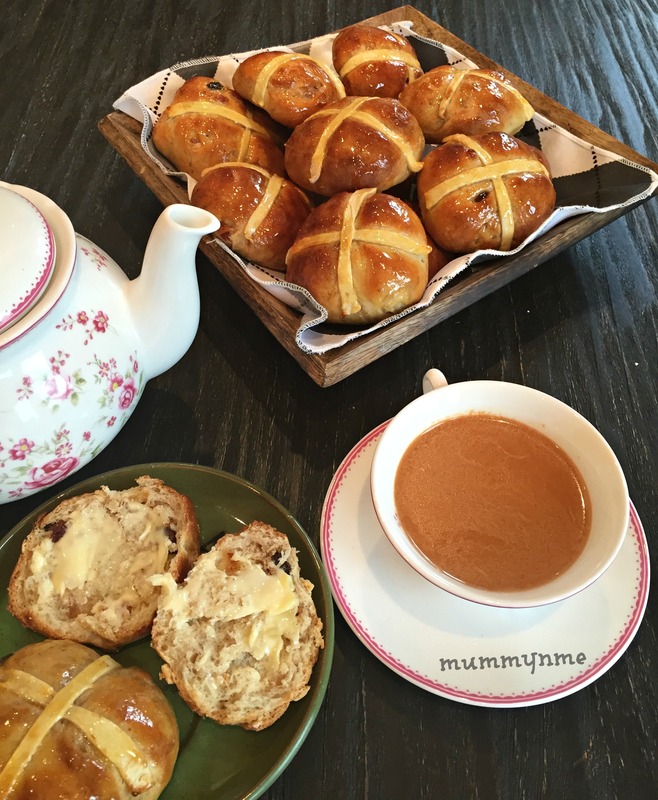 glaze the buns generously and have them with your favourite cuppa!! 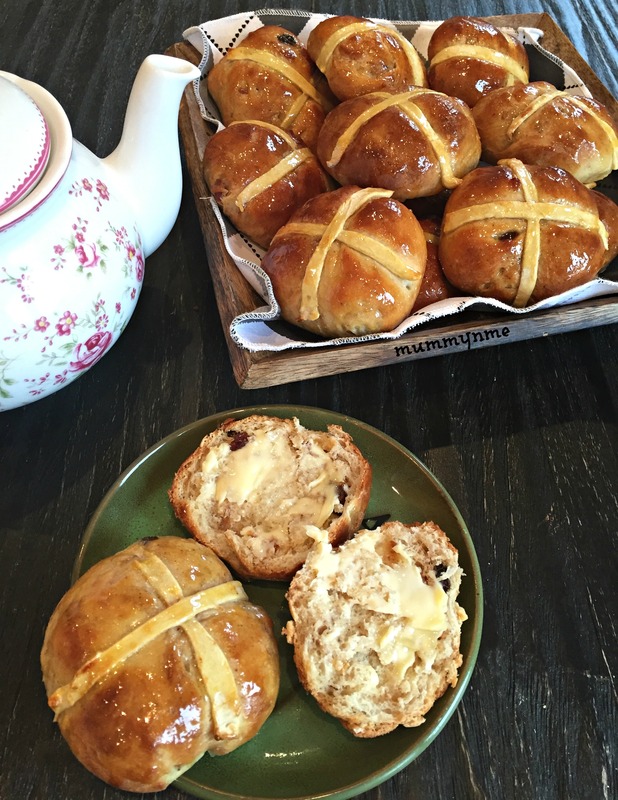 Traditionally Hot cross buns have nutmeg and cinnamon. But I chose cloves as the main spice since I like the sharpness in it. I loved it with cloves and honestly I feel cloves are so underrated. I got a new microwave which has a dough proofing option. I proved the dough in the microwave for the first time rather reluctantly but I am very pleased with the results. It does take an hours time but I guess we can be sure it will rise in that time unlike the natural proving which depend on the temperature. If you want to really save the time, prove the dough overnight and skip the second prove. Should work just fine. I skipped second proof so many times in bakes. Oil your bowl and the cling film when you prove the dough to keep the dough from sticking to the bowl. I don’t like my buns overloaded with fruit so I used them cautiously, but if you like them go for it and add a few more of those dried fruits. To keep the fruit in your bun plump and juicy , soak them in water or any juice for couple of hours. I did use egg wash half way through the bake for more defined colour. So after 10-12 minutes, quickly apply the egg wash on your buns and return to bake for the next 5 minutes. Applying egg wash at the beginning browns the buns quickly and makes it hard to judge if the bake is done. 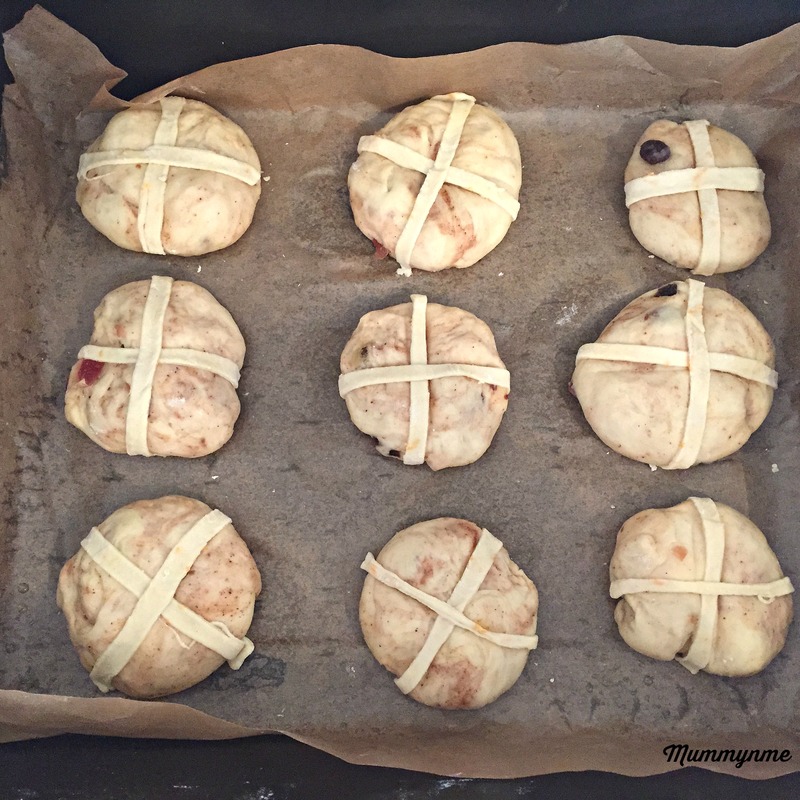 For the cross, you can also make a more runny mixture, and pipe the cross on the buns instead of rolling the dough and laying out the crosses on the buns. Again, experiment with glaze. Jam glaze is another option to make those buns sticky and give them a shiny look. if you do not have Jam or golden syrup, Just make the glaze with sugar and water. Works just fine. C'mon.. follow me ..now ! !